Come explore with Haunted Haight Walking Tours the many ghosts Stories , urban legends and macabre history that San Francisco's most famous most haunted district has to offer. Get the most out of your vacation to Haunted San Fransisco, Take The Haunted Haight Ghost Tour! Tommy Netzband Top Ten Most Haunted List San Francisco to see a real ghosts! 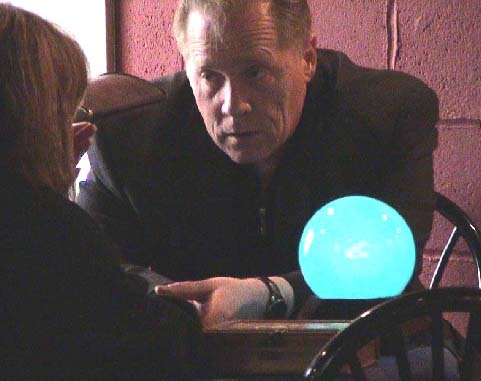 Tommy Netzband is the founder of the San Francisco Ghost Society and has a deep passion for the paranormal. He has appeared on paranormal radio shows and is the owner and creator of the Haunted Haight Walking Tour, winner of the San Francisco Bay Guardian's coveted "Best of the Bay" award. He is often called a "ghost historian" because of his research on hauntings. He is currently co-hosting a podcast called Supernatural San Francisco and is writing a book based on his award winning tour. He has presented several lectures for the SFGS events. spot in San Francisco. People hear voices, walking, cells slamming and there is a supposed evil presence in Block D of the main prison house. Many cold spots can be felt in the mess hall. See our short documentary "Secrets of Alcatraz" at www.sfghostsociety.org/html/cases. The Japanese tea garden at Golden Gate Park in San Francisco, California, an immensely popular feature, was originally built as part of a sprawling World's Fair, the California Midwinter International Exposition of 1894. This is a section of Golden Gate Park. For more than 20 years San Francisco Parks Trusts' Park Guides have given free tours providing context and history for this historic japanese-style garden. Many people have seen the woman of Stow Lake. She is always described in a white dress, long hair and glowing .Read more about the Stow Lake Ghost Story and of it's haunting here: www.hauntedamericatours.com/ghoststories/hauntedhaight. In the center of the city of San Francisco is a large park known all over the globe, called Golden Gate Park. It is the largest manmade park in the world! The park is larger than Central Park in New York City by a couple hundred acres! The park was commissioned in the 1870’s and has become one of the most beloved gems of the city by the bay. People from all over the world visit San Francisco to see the many attractions that Golden Gate Park has to offer. The De Young museum, Japanese Tea Garden and Flower Conservatory are only a few of the many reasons people are drawn to this park. The Haskell Residence, built in 1851, the home was built for Leonides Haskell, a fur trader and it was his private residence. US Senator David C. Broderick died here after losing a gun duel to former Judge David Terry. Broderick died 16 September 1859, four days after David S. Terry shot him. It is said Senator Broderick paced back and forth all night before the duel that took his life and it may have created a residual haunting. People claim to hear his footsteps and even tapping on the windows! Built in 1898, this beautiful building use to part of a removed secret society cemetery called "The Odd Fellows." The building is reportedly haunted according to the caretaker, Emmit Watson and he speaks of a ghostly little girl who haunts the building near the "niche" (or what Emmit calls "condo or apartments") where this little girl's ashes are sealed in a urn behind glass. The Columbarium of San Francisco is a mausoleum for human ashes built in 1898 by architect Bernard J.S. Cahill. A beautiful example of Victorian architecture, the copper-domed Columbarium holds the remains of some of San Francisco's most prominent founding families, and such notable individuals as Harvey Milk. It is the only burial place remaining available in the City. In disrepair for much of the 20th century, it has been largely restored by caretaker Emmitt Watson and the Neptune Society. The Columbarium is at 1 Loraine Court, near the intersection of Stanyan and Anza Streets, just north of Golden Gate Park. It is open to the public. The Columbarium is a combination of Greek and Roman design. Cahill was probably inspired by the Columbian Exposition of 1893 in Chicago. The diameter, from the entrance to the stained glass window opposite, is 64 feet. The width of the rotunda within the Inner circle is 29 feet and the rotunda reaches a height of about 45 feet. Each of the rooms on the ground floor bears the mythological name of a wind. The first floor rooms are named after constellations. The second and third floors are simpler in design. The ground floor contains approximately 2,400 niches, the first floor 2,500, and the second and third floors approximately 1,800 each. There are seven windows on the ground floor, of which six are stained glass, with biblical themes. The seventh window, of two torches, was stolen in 1980. On the left as you enter the building is a window depicting three angels in flight, which is thought to be designed by Louis Comfort Tiffany or by John LaFarge. The Notus room has a stained glass window of Christ with his arms extended. People claim to have seen men in old war uniforms and sounds of loud knockings coming from deserted rooms at this former Army post that is now run by the National Park Service as a visitor center for the San Francisco's Presidio. by hiding them in this home. Police raids were frequent, so she hid immigrants in the basement and sealed the doors so police could not enter. It is said, there were secret underground tunnels so people could come in and out. Over the years people have heard voices and seen moving lights. It was said that some of the immigrants died in the great fire and earthquake of 1906 and are still bound to this place. The original building was destroyed in the great fire og 1906 , but soon after she had it rebuilt. Cameron House is a Chinatown-based multi-service agency serving Asian communities in the San Francisco Bay Area. Motivated by our Christian commitment to promote healthy communities, we have served individuals, immigrant families and youth since 1874. 800 Chestnut St, San Francisco, CA Founded in 1871, The ground underneath this heralded school was a graveyard until it was moved; rumor has it some spirits stuck around. It is said to have been built over an old graveyard and there are many people who claim the tower of the building is very haunted and screams and noises are heard there all the time. The San Francisco Art Association (SFAA) was founded in 1871 and it opened the San Francisco School of Design in February 1874 under the direction of landscape painter Virgil Macey Williams. In 1893 the name was changed to California School of Design and the association affiliated with the University of California and inherited the mansion of Mark Hopkins on Nob Hill. Its museum functions continued under the title of the Mark Hopkins Institute of Art. The fire following the 1906 San Francisco earthquake destroyed both the mansion and the school. A year later, the school was rebuilt on the site of the old mansion and renamed the San Francisco Institute of Art. In 1916 the SFAA merged with the San Francisco Society of Artists and assumed directorship of the San Francisco Museum of Modern Art, then located in the Palace of Fine Arts, a relic of the Panama-Pacific International Exposition. The school was also renamed the California School of Fine Arts (CSFA). In 1926 the school was moved to its present location at 800 Chestnut Street in San Francisco. In 1961 the school was finally renamed to its modern name, the San Francisco Art Institute. In 1969, a new addition to the building by Paffard Keatinge Clay added 22,500 sq. feet of studio space, a large theater/lecture hall, outdoor amphitheater, galleries, and cafe. The Mary Lake Suite is reportedly haunted by Miss Mary Lake the head mistress of the girls school that once occupied the building in the early 1900's. Reports are that she tucks you in tightly at night if you spend the night in her suite. She is also known to roam the hotel and appear in the mirrors in the halls and lobby. Built in 1890 by Comstock silver king Senator James G. Fair, this landmark building started out as Miss Mary Lake’s School for girls, and narrowly escaped destruction by the famous 1906 quake. Thankfully it survived as one of San Francisco’s best examples of Victorian splendor, and became an award-winning B&B hotel. Teacher Mary Lake is said to permanently haunt room 410 at this former school for girls. Many of the Queen Anne’s notable architectural features have endured, and except for contemporary elements like telephones, high-speed internet, elevators and luxurious bathrooms, not much has changed over the last hundred years. In 1980 the structure was carefully restored, retaining as much of the original as possible: marble sinks, crown moldings, leaded-glass windows, inlaid parquet floors and wood-burning fireplaces. Often referred to as the "Ellis Island" of the West, many Chinese immigrants were processed here. There are many stories in the old buildings about footsteps, cries and apparitions of Chinese men and women. Angel Island is an island in San Francisco Bay that offers spectacular views of the San Francisco skyline, the Marin County Headlands and Mount Tamalpais. It is a California state park, Angel Island State Park. The highest point on the island, almost exactly at its center, is Mount Livermore at 788 ft. (240 m). Until about ten thousand years ago, Angel Island was connected to the mainland; it was cut off by the rise in sea levels due to the end of the ice age. From about two thousand years ago the island was a fishing and hunting site for Coast Miwok Native Americans. In 1775 the Spanish naval vessel San Carlos made the first European entry to the San Francisco Bay under the command of Juan de Ayala. Ayala anchored off Angel Island, and gave it its modern name (Isla de los Angeles); the bay where he anchored is now known as Ayala Cove. Like much of the California coast, Angel Island was subsequently used for cattle ranching; this destroyed most of the native oak woodland and brush cover. In 1863, during the American Civil War, the U.S. Army established a camp on the island (now known as Camp Reynolds or the West Garrison), and it subsequently became an infantry garrison during the US campaigns against Native American peoples in the West. In the later nineteenth century, the army designated the entire island as "Fort McDowell" and developed further facilities there, including what is now called the East Garrison or Camp McDowell. During the Spanish-American War the island served as a discharge depot for returning troops. It continued to serve as a transit station throughout the first half of the twentieth century, with troops engaged in the First and Second World Wars embarking and returning there. During World War II, Japanese, and German POWs were also held on the island. The army abandoned the island in 1946, but returned in the 1950s when a Nike missile base was constructed; this was decommissioned as obsolete in 1962. A tragedy took place in the 1920's as a ticket booth worker was murdered in a robbery attempt. Many people over the years claim to have seen him in the theatre as an apparition in the mirror that hangs in the lobby. The historic Curran Theatre opened in 1922 and has been one of California’s most successful Broadway theaters ever since. Its roots go back to New York City and the famous Shubert brothers, who were looking to expand their holdings across the country and break the monopoly of the Theatrical Syndicate, which at the time controlled most of the bookings and theatrical productions. So the Shuberts teamed with Homer Curran and helped raise nearly $1 million to build a Broadway-quality theater in San Francisco. The result was smashing success and the theater has hosted top shows and actors like Katharine Hepburn, Vincent Price and Carol Channing. Get your Curran Theatre tickets from Gotickets. The Curran Theatre underwent a massive restoration project in 1993 in preparation for Andrew Lloyd Webber’s Phantom of the Opera, which played at the theater for five years. Get the most out of your visit to Haunted San Fransisco, Take The Haunted Haight Ghost Tour! The baths are purported to be frequented by ghosts who throw lit candles into the rocky waters below. Legend has it that this historic, elegant hotel was once a brothel, and the Madame still holds court in Room 33. The apparitions of baseball players wander the aisles of this supermarket, located on the site of the old Seals Stadium. Famed playwright Lillian Hellman is allegedly the mischievous ghost who haunts room 207. Piano player Lester tickled the ivories during the Roaring '20s; since then, staff has reported hearing piano tunes in the empty lounge. This restaurant and former speakeasy may play up its haunted reputation, but the bloody lady in blue is supposedly genuine.